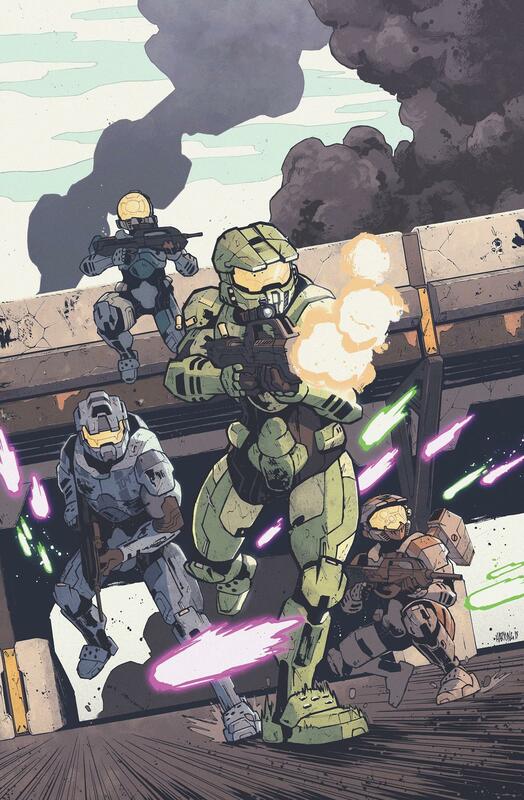 MILWAUKIE, Ore., (March 08, 2018)—In a story based on Halo’s most iconic hero, Dark Horse Comics and 343 Industries are proud to present a new three-issue miniseries Halo®: Collateral Damage-A Master Chief Story. This miniseries takes place shortly after the events of the Halo: Fall of Reach comics. Alex Irvine (Halo: Rise of Atriox #4, Iron Man: The Rapture, Dark Sun) returns to the Halo universe to pen this new series and is joined by artist Dave Crosland, colorist Leonard O’Grady, letterer Simon Bowland, and cover artist Zak Hartong. Halo®: Collateral Damage follows the Master Chief and Blue Team as they are deployed by the UNSC to an unstable colony world. Their mission: terminate the Covenant’s efforts to uncover something ancient and powerful beneath the planet’s surface. But as the mission takes a turn for the unexpected, the Spartan strike team realizes that the stakes of their mission are higher than they realized and they’ll have to rely on each other and a small group of human rebels to survive!